Treat yourself every day with a creamy latte. A delicious latte in an instant is at your fingertips with ORGANO™ Gourmet Café Latte. Our finest quality Arabica, Robusta beans and Ganoderma are blended with non-dairy creamer and sugar for a creamy latte minus the wait in line! Flavourful, fast and delightfully uplifting — Gourmet Café Latte is how you’ll want to start out every morning. Organo™ Café Latte is a delicious blend of robust espresso style coffee and non-dairy creamer. Our finest quality Arabica, Robusta beans and Ganoderma are blended with non-dairy creamer and sugar for a creamy latte — minus the wait in line! Arabica and Robusta coffee –Arabica coffee is the finest, richest coffee in the world. The beans we use have a unique sweet-soft flavour. The unroasted beans smell like blueberry and once roasted, they yield a floral/fruit floral scent that speaks to its soft flavour. They are grown at higher altitudes than other coffee beans, in cool, subtropical climates. Robusta coffee is less common than Arabica, this coffee is produced at lower altitudes than Arabica, yielding a less sweet and bolder flavour. It is often used most in Italian espresso, giving it that dark, rich, complex flavour. 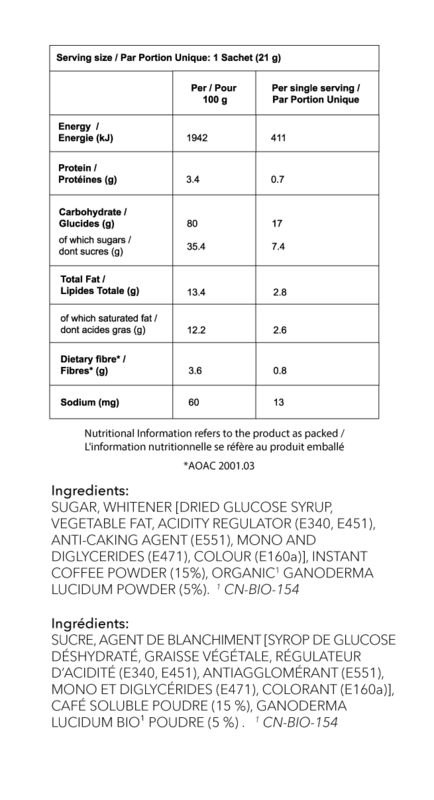 Fibre – each Café Latte provides 1.9 gr of fibre. Ganoderma – also known as the red Reishi mushroom, this mild flavour adds a note of depth to the coffee flavour. Ganoderma has been used in traditional Asian culture for thousands of years. The name Ganoderma means “spiritual potency”, while the Japanese name Reishi can be translated as “King of Herbs”. Non-dairy creamer – adds a hint of creamy flavour. Coffee has been enjoyed for hundreds of years and the first coffee house opened in Italy, around 1645. A latte tends to be 1/3 espresso, and 2/3 milk. Latte is the Italian word for ‘milk’. Empty 1 sachet into your favourite cup, fill with hot water, stir and enjoy! Can also be mixed and then add ice for a creamy cool coffee treat. 170ml – Rich and flavourful, 225ml – Smooth and creamy, 285ml – Light and flavourful. 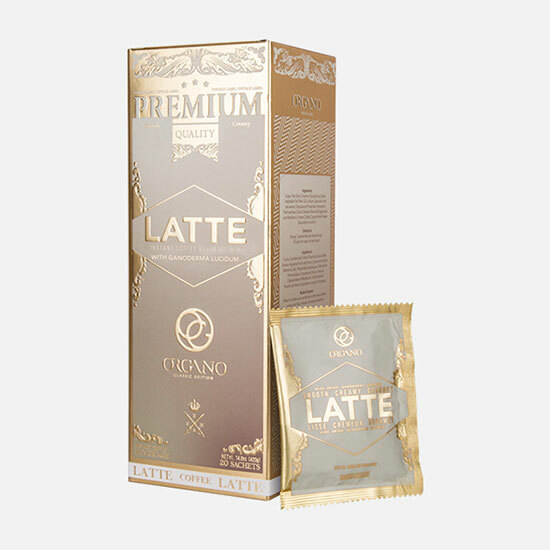 Organo™ Café Latte provides coffee with ganoderma, and naturally contains fibre.